MACRA is one of the most significant pieces of healthcare legislation in over a decade. Known as the Medicare Access and CHIP Reauthorization Act of 2015, this bi-partisan legislation was signed into law on April 16th, 2015, setting the course for a modern-day healthcare reformation. Whereas MACRA’s predecessor the Affordable Care Act of 2010 (ACA) focused on the expansion of and improvements in healthcare coverage, MACRA focuses on healthcare quality and value of care delivery by improving Medicare access and implementing healthcare payment reform. The law includes some of the following: a two-year extension to Medicaid’s Children’s Health Insurance Program (CHIP); extensions to other Medicare and health programs and policies; Medicare beneficiary reforms; and statutes designed to protect the integrity of Medicare. However, MACRA’s most influential and far-reaching policies are the repeal of the Medicare Part B Sustainable Growth Rate (SGR) reimbursement methodology, and the phasing out of the Medicare Physician Fee Schedule (PFS) with a more streamlined payment system known as the Quality Payment Program (QPP). This new Medicare performance and payment adjustment strategy is designed to transform the healthcare system by encouraging the development of value-based care models, by aligning healthcare coordination and cooperation across specialties, and by incentivizing clinicians to make advancements in clinical improvements and technology. The Centers for Medicare and Medicaid Services (CMS) was tasked, through MACRA legislation, to design and to implement Medicare payment reform that focuses on patient-centered care. The MACRA legislation, and specifically the implementation of the Quality Payment Program (QPP) is a monumental and complicated undertaking. The QPP is literally a restructuring or “re-imagining” of the healthcare industry as we know it, changing the way clinicians have been conditioned to provide care through the fee-for-service (FFS) payment model. "Our goal is to support patients and clinicians in making their own decisions about health care using data driven insights, increasingly aligned and meaningful quality measures, and innovative technology. To implement this vision, the Quality Payment Program emphasizes high-value care and patient outcomes while minimizing burden on eligible clinicians. The Quality Payment Program is also designed to be flexible, transparent, and structured to improve over time with input from clinicians, patients, and other stakeholders…. We understand that technology, infrastructure, physician support systems, and clinical practices will change over the next few years and are committed to refine our policies for the Quality Payment Program with those factors in mind. We are aware of the diversity among clinician practices in their experience with quality-based payments and expect the Quality Payment Program to evolve over multiple years." The changes in the Quality Payment Program (QPP) timeline stretch from 2017 through 2026+. Notably, the Medicare Part B Physician Fee Schedule ends in 2020, while performance-based payment adjustments (+/-) and payment incentives for qualifying participants begin in 2019. These payment changes are designed to influence clinician behavior and to help change the healthcare landscape from fee-for service (FFS) to value-based, patient-centered care that improves health and reduces costs. Both pathways are regulatory “environments” developed to transition physicians from fee-for-service (FFS) to value-based care. Each framework establishes measurements used to score clinicians on performance to determine payment adjustments and bonuses. Initially, the MIPS framework will regulate most clinicians, who will receive varying payment adjustments based on performance. The remaining clinicians will choose to take on the financially “riskier” AAPM framework, excluding them from MIPS reporting, and potentially providing them with annual bonuses through 2024. All adjustments and incentive payments begin in 2019. Fee Schedule Updates will continue at 0.5% from 2016-2019, drop to .0% from 2020-2025, and then as a long-term incentive, the Qualifying (0.75%) and Non-Qualifying (0.25%) APM conversion factor will begin in 2026+, compounding upon itself each year. MIPS +/- Payment Adjustments start at 4% in 2019 and increase to 9% in 2022+. 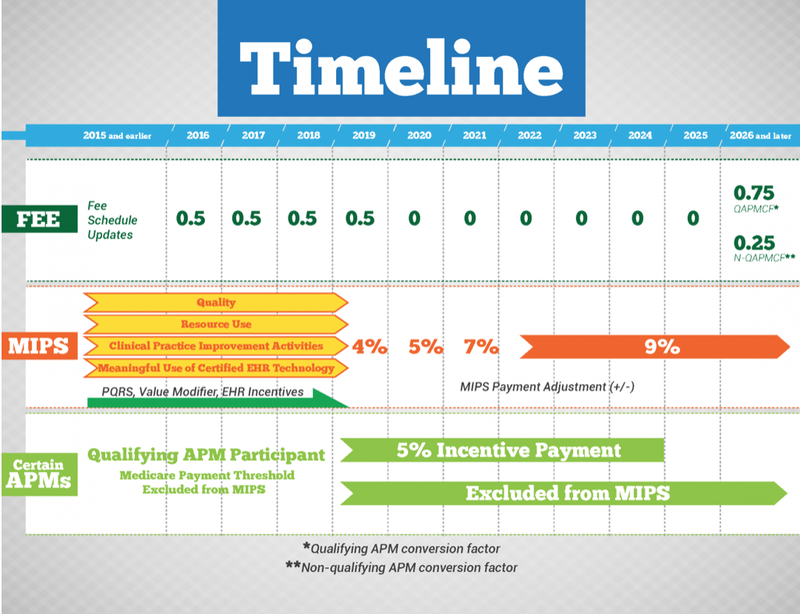 Qualifying APM Participants receive a 5% incentive payment (lump sum bonus) from 2019-2024 and are excluded from MIPS Scoring and payment adjustments beginning in 2019. It’s best to think of the Merit-based Incentive Payment System (MIPS) as the default pathway in the Quality Payment Program (QPP). All clinicians are subject to the same performance reporting, scoring, and payment adjustments under MIPS. However, clinicians have the option to choose to be involved in a “next step” payment structure called an Alternative Payment Model (APM) (not to be confused with the Advanced Alternative Payment Model [AAPM]). Alternative Payment Models (APMs) have a combination of MIPS scoring and APM scoring, an adjusted APM scoring standard, that gives added incentive payments to those clinicians who more aggressively focus on quality measures, improvement activities, and advancing care information. Alternative Payment Models (APMs) can be specific to a clinical condition, a care episode, or a population. 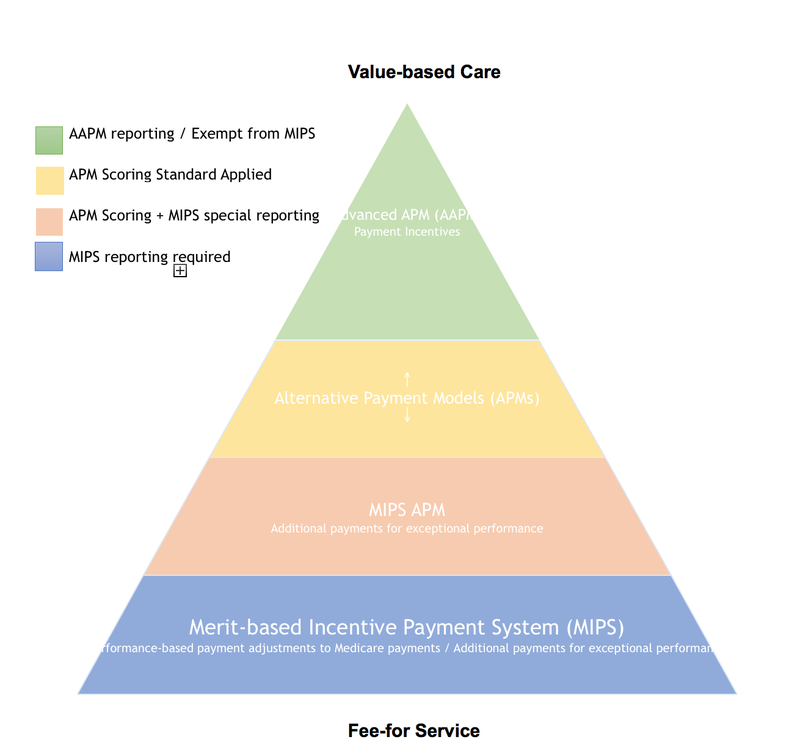 Whereas MIPS is the default scoring and performance framework in the QPP, the Advanced Alternative Payment Model (AAPM) is the top-level scoring and performance pathway. The goal of the QQP’s Medicare reform is to gradually move clinicians from solely practicing under MIPS, to practicing within an Alternative Payment Model (APM), to ultimately practicing within an Advanced Alternative Payment Model (AAPM). Advanced APMs are often referred to as “subsets” of APMs; however, this can be misleading, because Advanced APMs are an “advanced” version of the Alternative Payment Model, functioning at a higher level of APM participation and risk. While we are clarifying things a bit, it’s helpful to note that clinician groups that operate under the AAPM framework are also referred to as Advanced APMs (AAPMs). The interchangeable use of the AAPM acronym as a label can be confusing at times, so it’s valuable to be aware that the Advanced Alternative Payment Model term can be used to refer to the payment model and the Advanced APM entity group adhering to the model. AAPM entity groups are organizations that coordinate with CMS to meet this higher level of healthcare criteria; specifically, AAPMs meet a combination of expectations focused around the Use of Certified Electronic Health Record Technology (CEHRT), Quality Measures, and most importantly Financial Risk. AAPMs take on a greater amount of “downside risk,” or “two-sided risk,” than their APM counterparts, and this is what qualifies them as AAPMs. It’s important to recognize that the Financial Risk criterion is the significant qualification that moves a clinician, or group of clinicians, out of any version of the MIPS reporting and payment framework and into the Advanced Alternative Payment Model (AAPM) framework. Because Advanced APMs manage greater financial risk, CMS exempts them from the MIPS reporting system altogether. In implementing the new law, we were guided by the same principles underlying the bipartisan legislation itself: streamlining and strengthening value and quality-based payments for all physicians; rewarding participation in Advanced APMs that create the strongest incentives for high-quality, coordinated, and efficient care; and giving doctors and other clinicians flexibility regarding how they participate in the new payment system. Clinicians billing $90,000 or less in Medicare Part B charges, or who provide care for 200 Part B patients or less in one year (this was raised from $30,000 and 100 patients in performance year 2017). Under MIPS the three existing reporting programs—the Physician Quality Reporting System (PQRS), the Value-based Payment Modifier (VBPM), and Meaningful Use of Certified EHR Technology (MU)—are renamed and combined with a new Improvement Activities (IA) category to score physician performance. Each performance category has measurements and/or activities that must be reported to earn points toward a clinician or clinician group’s overall final score (1-100). CMS has given clinicians the flexibility to choose and to report on Quality and Advancing Care Information (ACI) measurements that fit their practices. CMS also allows for clinicians to simply attest to completing Improvement Activities (IA) for reporting purposes. When combined with Cost data calculated from adjudicated claims, clinician scores are compared against CMS-defined performance thresholds, and the final composite performance score (CPS), or MIPS Score, is used to determine the clinicians’ percentage of Medicare reimbursement payments. MIPS is designed to be a budget-neutral program, but there are $500 million allocated to provide additional incentives to exceptional performers. The performance categories are “weighted” and make up a certain percentage of a clinician or clinician group’s final score. 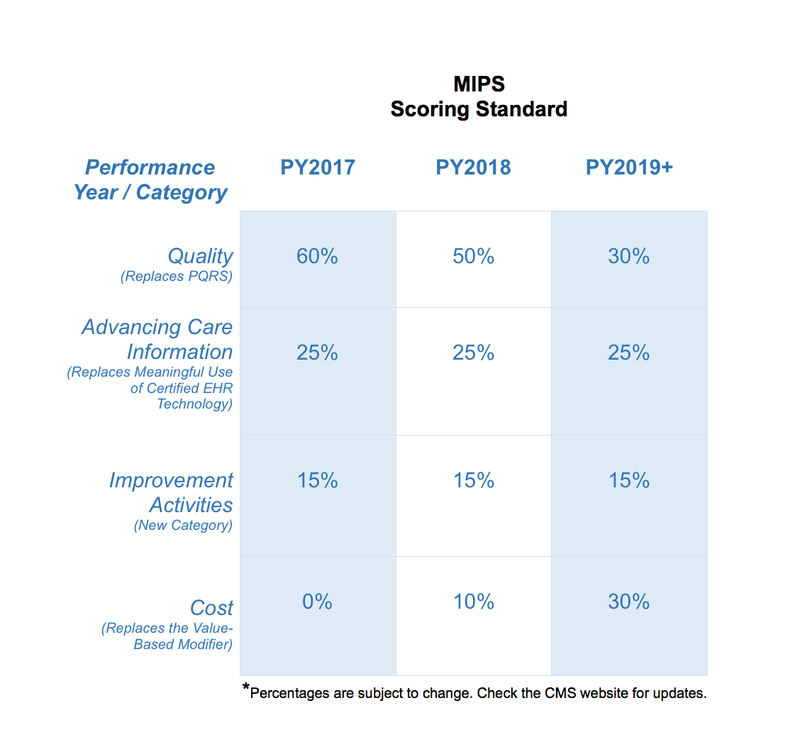 The MIPS eligible clinician’s (EC) composite performance score will either exceed, meet, or fall short of the performance threshold set by CMS, and this score determines a positive, neutral, or negative Medicare Part B payment adjustment. Payment adjustments begin in 2019 (performance year 2017), and gradually increase from 4% to 9% in 2022. ‍An innovative payment model expanded under the Center for Medicare and Medicaid Innovation (CMMI), with the exception of Health Care Innovation Award recipients. A Medicare Shared Savings Program (MSSP) Accountable Care Organization (ACO). Medicare Health Care Quality Demonstration Program or Medicare Acute Care Episode Demonstration Program. Another demonstration program required by federal law. Advanced Alternate Payment Model (AAPM) entity groups participate in the following performance categories: Use of CEHRT, Quality (comparable to those used in MIPS), and Financial Risk. CMS initially determines if an APM qualifies as an AAPM, exempting it from MIPS scoring. At the time of this article, there were approximately 49 qualifying Alternative Payment Models listed in the Quality Payment Program (QPP) and only 14 of those models met the requirements as an Advanced APM (AAPM). Which Clinicians are Affected and How Do They Qualify? The Advanced Alternative Payment Model (AAPM) affects eligible clinicians (ECs) from the MIPS framework who join Advanced APM (AAPM) entity groups. These groups take on a higher level of financial risk related to their patients’ outcomes. Ultimately, CMS would like every clinician to move into the AAPM framework by joining a qualified Advance APM entity group. Eligible clinicians in MIPS must qualify to participate in Advanced APMs by achieving payment amount or patient count thresholds during each performance year. For example, in performance years 2017 and 2018, for eligible clinicians to become qualifying participants, they must receive at least 25% of their Medicare Part B payments or see at least 20% of their Medicare patients through the AAPM. These thresholds increase over time. If achieved, the MIPS eligible clinicians become Qualified Participants (QPs) in the AAPM framework, exempting themselves from MIPS scoring and payment adjustments. If eligible clinicians do not qualify, or only partially qualify (Partial QP), as participants in an Advanced APM, then they are subject to special scoring in MIPS with a modified APM scoring standard. It’s worth noting that eligible clinicians (ECs) can become Qualifying Participants (QPs) or Partial Qualifying Participants (Partial QPs) in multiple APM or Advanced APM entity groups. CMS estimates that almost 100% of eligible clinicians in Advanced APMs will be Qualifying Participants (QPs) based on performance year 2017, meaning that they will be eligible to receive a 5% lump sum performance bonus in 2019. ‍APM entities participate under an agreement with CMS. APM entities include one or more MIPS eligible clinicians on an APM participation list. APM bases performance, payment incentives on cost/utilization and quality measures. How are MIPS APMs Scored? MIPS APM entity groups are subject to a modified MIPS performance category scoring, but the weights of each category are different than the standard MIPS scoring. 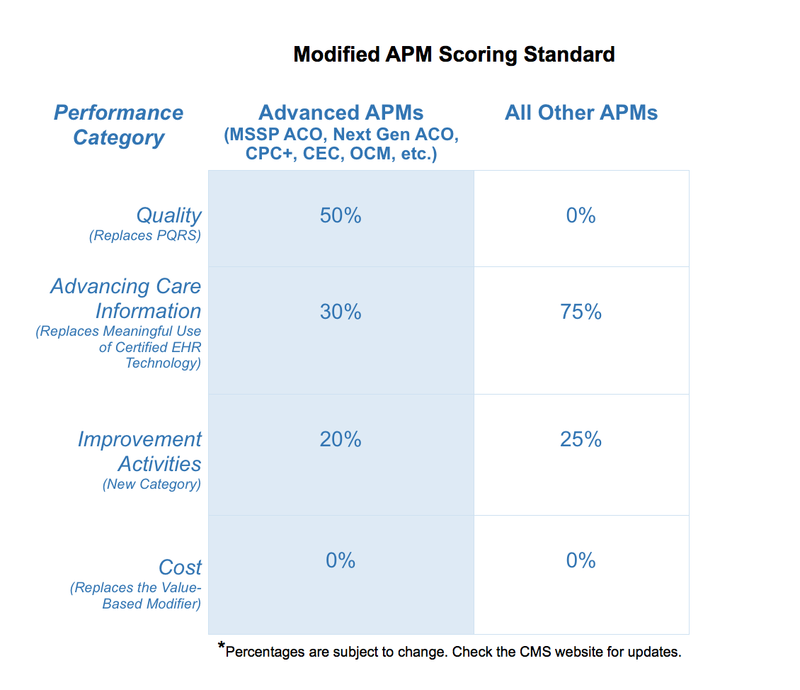 This modified APM scoring standard takes into account the Use of CEHRT and Quality Measures criteria that already qualifies the organization as an APM. Advanced APMs are exempt from MIPS Scoring; however, the APM scoring standard is designed as an “overlap” or “backup” type of scoring for those Advanced APMs that may not qualify for Advanced APM status for a reporting period. When this happens, MIPS special scoring is applied to the AAPM entity group, and the APM scoring standard takes into consideration the standards already needed to be an APM. Advanced APMs are exempt from MIPS Scoring; however, the APM scoring standard is designed as an “overlap” or “backup” type of scoring for those Advanced APMs that may not qualify for Advanced APM status for a reporting period. When this happens, MIPS special scoring is applied to the AAPM entity group. This MIPS APM scoring standard takes into consideration the standards already needed to be an APM. In spite of the complexity of MACRA and the ongoing evolution of the Quality Payment Program, the Centers for Medicare and Medicaid Services (CMS) is committed to making sure of the following: the Program’s measures and activities are meaningful; clinician burden is minimized; care coordination is better; and clinicians have a clear way to participate in Advanced APMs. CMS has dedicated a website to providing resources to help clinicians understand the workings of MACRA and the Quality Payment Program (QPP). This resource library includes detailed information and ongoing updates regarding the Merit-based Incentive Payment System (MIPS) and the Advanced Alternative Payment Model (AAPM), and involving category scoring, measures and guidelines, performance thresholds, payment adjustments, program timelines and other important information alluded to in this article. You can find it here https://qpp.cms.gov/.